While the UH-60 Black Hawk helicopter will remain a mainstay of Army vertical-lift aviation for years to come, plans are afoot to develop its replacement. While the new aircraft is probably 20 years away from a production-line startup, prospective contractors have distinct ideas about how it would look and perform. Two competing helicopter-vertical lift aircraft displayed mock versions of their future vertical-lift designs this week at the Association of the United States Army Annual Meeting and Exposition. 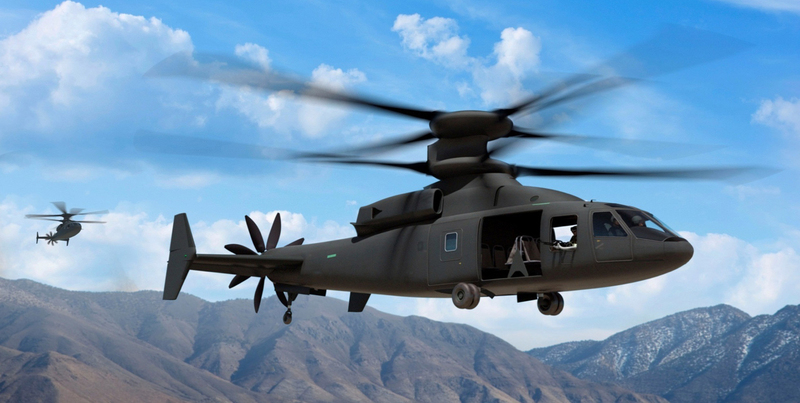 Boeing and Sikorsky are jointly building the SB-1 Defiant. Bell Helicopter worked with Lockheed Martin on the V-280 Valor. Sikorsky-Boeing’s SB>1 Defiant features two overhead rotors that share a common axis but move in opposite directions, and an eight-blade “pusher prop” tail rotor that is rear-mounted perpendicularly to the airframe. Bell’s V-280 Valor closely resembles the V-22 Osprey, with its tilt-rotor design. The two aircraft have some significant differences, however. Whichever aircraft ultimately prevails in any future contract competition will have to exceed present standards for lift, airspeed, range and capacity. Bell and Sikorsky believe their respective proposals will more than exceed the Army’s requirements. While recognizing the Osprey’s ability to hover and fly like a conventional aircraft, Richard Koucheravy of Sikorsky believes the better avenue is to develop an improved aircraft – designed along the lines of a conventional helicopter. “Our approach is an advanced platform based on the technology Sikorsky initially created,” Koucheravy told AUSA. The top rotor system, which Sikorsky has named X2 Technology, relies on twin rotors mounted with one drive shaft inside the other. Because they spin in opposite directions, Koucheravy said, there is no need for a conventional tail rotor. “A single [top] rotor aircraft needs a tail rotor to provide torque and prevent the aircraft from spinning in the opposite direction of the main rotor,” Koucheravy said. The pusher propeller enables the Defiant to go faster. Koucheravy said the company is operating under the idea that the Defense Department would make a decision for initial articles of production no sooner than 2030, under best conditions. As of now, the plan is to test software and other systems at the company’s Stratford, Conn., facility. There are also plans to bolt a prototype aircraft to the ground in West Palm Beach, Fla., to test power plants and other systems. Steve Mathias, vice president of global development at Bell, told AUSA that a V-280 prototype would fly sometime this fall. “The requirements from the Army are it should exceed 230 knots airspeed and hover at 6,000 feet at 95 degrees – like Afghanistan. We’ll exceed that,” Mathias said. He cited the company’s 60 years of experience in vertical flight, including the 400,000 flight hours logged by the Osprey to date. “All the lessons we learned from the V-22 are applied to this aircraft,” Mathias said. By using digital, three-dimensional design, Bell is offering a system that would eliminate the need for paper manuals. “The maintainers would use the same tools the builders used,” Mathias said. He also pointed out that the V-280’s engines do not rotate, as do the V-22’s. “With the straight-wing versus swept-wing concept, a mid-wing gearbox goes away. It reduces cost and weight,” Mathias said. From a survivability standpoint, the Valor’s engines and transmission are not positioned above the cabin, as with a conventional helicopter. “In a crash sequence, should one occur, there is no engine or transmission to fall through the cabin. The wings and rotors are designed to boost away from the cabin as well,” Mathias said. “We have no doubt this will meet all the handling requirements the government will give us. It will be extraordinarily agile, with maneuverability and high speeds to go along with that,” he said.